I use passwords all the time and it is amazing and I usually have no issues until the latest major update to the software. In this update, the destination of licenses, help and earn reward change/was added. 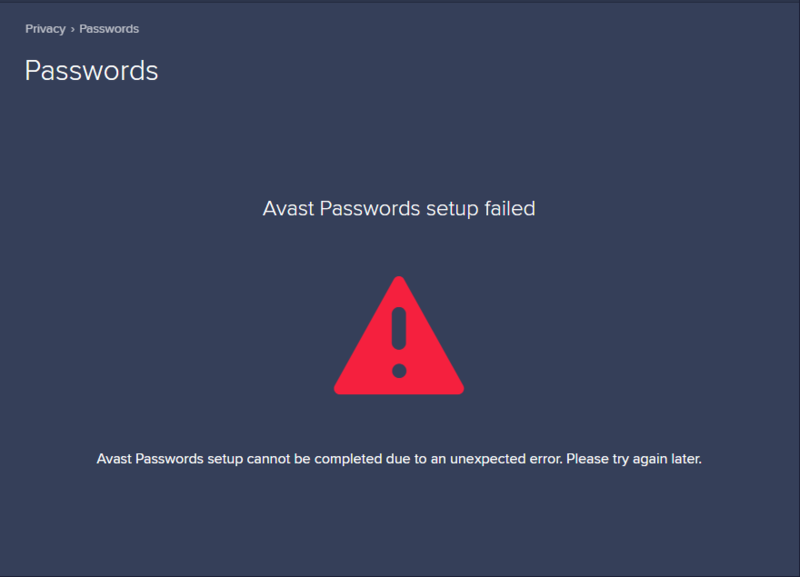 With this update, my passwords have been reset and if I click the "Get Started" button to create a new password database, I get an error saying "Avast Passwords setup failed... Avast Passwords setup cannot be completed due to unexpected error. Please try again later." I have tried multiple time and to no luck. On my old hard drive with Avast installed it works perfectly and syncs with my phone but not on this hard drive. My passwords are still synced on my phone, tablet and other hard drive, I just need it fixing on this hard drive. I do not want to reinstall Avast and I am hoping that it's something in appdata that I can delete as with one game I had this fixed the issue that was occurring. However, if necessary I will use this method as while it will be a pain, it will be better than having to open my phone to get my passwords. I suspect that in your case, you might be missing a registry key thats helping Passwords locate your vault. - Following command in cmd.exe and provided its output. - Regedit.exe (via Start -> Run -> "regedit") and navigate to HKEY_CURRENT_USER\Software\AVAST Software\Avast\PRIVATE. There should be a key called PAMVaultLocation and I'll need to know its value. In case you get access error, please disable Avast self-defense module first in Avast's settings (Troubleshooting section). In regedit, the value of PAMVaultLocation is "denni"
Sorry for delay, can you please delete the PAMVaultLocation key from registry and everything from C:\USERS\DENNI\APPDATA\LOCAL\AVAST SOFTWARE\APM folder. In case you are not able to delete all files because some of them are in use, please disable self-defense module in avast (AvastUI -> Settings -> Troubleshooting) and kill all AvastUI.exe processes via Task Manager. After deleting everything run AvastUI and try to create new Passwords vault. It should work now. Thank you! This resolved my issue, thank you again for your help.